We all have at least one. Sometimes it’s the grandparent that truly doesn’t need anything, but you still want to give them a little something. Or maybe you’ve been roped into an office gift exchange with a coworker you barely know. You’re seriously thinking about buying her a candle, even though you know she’s probably got 32 unburned candles from previous gift exchanges. Is there a friend far away that you’d like to know you’re thinking of them? I should probably explain. 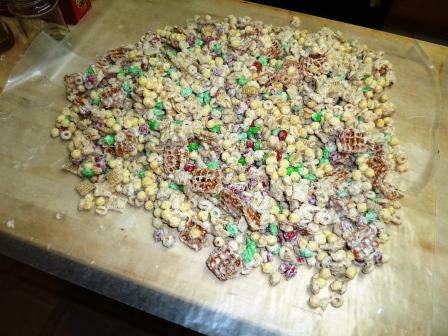 It’s innocuous name is white chocolate Chex mix, but that takes a long time to say. Several years back, a friend started calling it crack, and it stuck. It is white and addictive. My great aunt used to bring a giant tin of this over to my family at Christmas, and we loved her for it. She has since passed, and for several Christmases, there was no crack. Feeling nostalgic, I found a similar recipe, and tinkered with it so it would match hers. I gave a few bags to some of the men in the family, and now I get calls every year wanting to know if I’m going to give it, because if I don’t, others will step into the breach. I usually end up making at least two batches, if not three, for various holiday functions where there are sad faces if it doesn’t appear. So, if you’d like to make someone’s holiday, make this, put it in a nice Christmas tin from Michael’s or A.C. Moore, and you’re set. If you can measure and stir, you can make crack. It keeps well for a couple of weeks in an airtight tin if you have to mail it or make it ahead of time. If you’re mailing it, layer in some wax paper for padding so you don’t have crack crumbs by the time it arrives. 1.Lay down 2 large sheets of wax paper side by side. You’re going to pour the finished crack on this. 2. 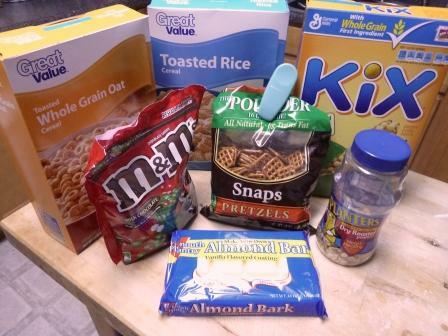 Use the biggest bowl in your kitchen, and measure the cereals, peanuts, pretzels, and M&Ms into it. Mix it up well with a large spoon. 3. Using a microwave safe bowl, melt the almond bark according to directions. This usually involves nuking it for about 90 seconds, stirring, and then heating in 30 second increments after that until melted. Almond bark is made to melt, so this shouldn’t be a problem. Just don’t don’t it in any trays they provide. I tried that once, and it was disastrous. 4. 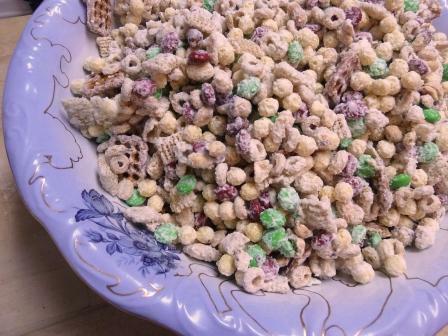 Pour melted almond bark over your bowl of Chex mix. Working gently but quickly with a spatula, fold the almond bark into the mix and coat it as thoroughly as possible. As it cools, it starts to set, making it harder to spread. 5. Once you’ve got the almond bark mixed in good with your Chex mix, then dump the whole bowl onto the wax paper in a big mound. Let cool. Once it has set, you can put it into tins. It will naturally break into chunks, but if you’d like them to be smaller, you can break them down some more.